Nitro-brew? Not this week. 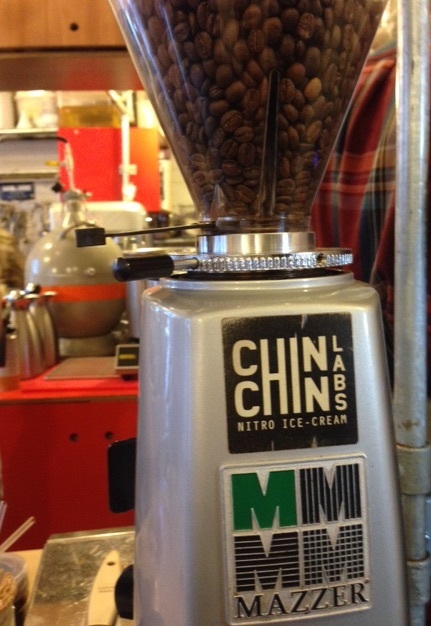 Coffee and liquid nitrogen at Chin Chin Labs (a nitrogen dewar is on the table behind the coffee grinder). It is true that Chin Chin Labs is not really a coffee-based café (although it does serve decently prepared, Monmouth roasted, coffee). Nonetheless, there is no question but that it has to be included as a cafe-physics review on Bean Thinking. Why? The answer is in the photo of the coffee grinder, though you may have to look carefully. You see, Chin Chin Labs is offering a different sort of café experience. Not coffee nor tea, but ice cream, indeed, Chin Chin Labs in Camden Lock advertises itself as the ‘future of ice-cream’ and the reason it does so is because here, all the ice cream is made with liquid nitrogen. There are only 3-4 tables inside Chin Chin Labs which makes it more of a take-away bar than a sit down café. 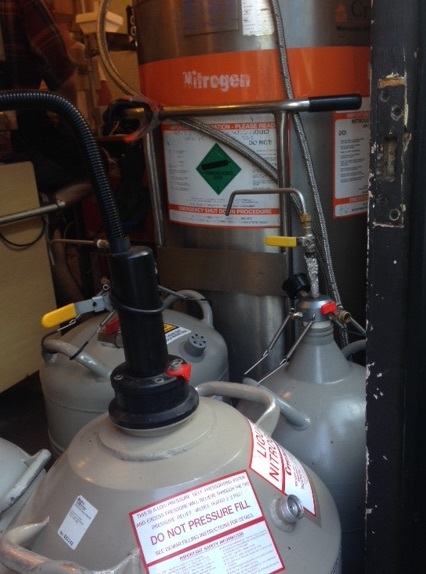 As you enter, a large dewar of liquid nitrogen is on your left, just behind the counter. Arranged behind this large dewar are a set of smaller dewars while on one of the ice cream preparation tables another (small) dewar sits with a pipe in it, ready for the nitrogen to be decanted out. If all these dewars are full, that is a lot of liquid nitrogen. The coffee is decent and prepared in the normal styles (espresso, Americano, cappuccino, latte), though this place is really not about the coffee (one of the staff expressed surprise that I’d ordered a coffee and not an ice cream). Next to the espresso machine were a set of glass beakers and glass containers as you would expect to find in a chemistry set, while the aprons worn by the staff had “Chin Chin Labs” written in a glittery, (futuristic or disco? ), font. There are many fun things that can be done with liquid nitrogen. From creating ice cream, through to shattering flowers and even to a possible solution for the energy storage problem (info here). Not to mention its important use as a coolant in all sorts of physics experiments and for biological storage. I have spent many hours decanting liquid nitrogen into buckets for basic experiments or into the first cooling stage of very strong magnets (such as are used in MRI machines). However, at -196ºC, liquid nitrogen is not a liquid that can be treated flippantly. Although it can be fun, and handled correctly there is no problem, it can nonetheless be very dangerous. Which is why something else about Chin Chin Labs struck me quite hard. While there were glass beakers and containers that a cartoon may feature as part of a science ‘lab’, there was none of the equipment that you would actually expect to see in a real lab where liquid nitrogen is used. In our lab, oxygen monitors beep (annoyingly) every 60 seconds*, eye goggles and proper cryogenic-suitable gloves are stored in a highly visible position easily accessible to anyone in the lab. Risk assessments are prominently displayed so that everybody is aware of the risk of oxygen depletion (leading to suffocation) were the nitrogen dewars in the lab to fail and suddenly vent all that liquid nitrogen into nitrogen gas in the lab. These things are not fun, but are a necessary part of running a lab in which cryogenic liquids (including liquid nitrogen) are stored and used. The final result: vanilla nitrogen-ice-cream. It is this contrast, between what is expected of a lab (glass beakers and complicated looking valves on the dewars) and what is in a lab (safety equipment and complicated looking valves on the dewars) that struck me. What do people, the public, café owners, think a lab looks like? What do they (you?) think a scientist looks like? Do we prefer indulging in our stereotyped ideas of a lab rather than think about the reality of life in a real science lab? I am sure (or at least I hope) that the safety equipment, oxygen monitors etc. are present, but hidden under the counter, at Chin Chin Labs. It should always be possible to have fun with liquid nitrogen, whether in a lab or a café. 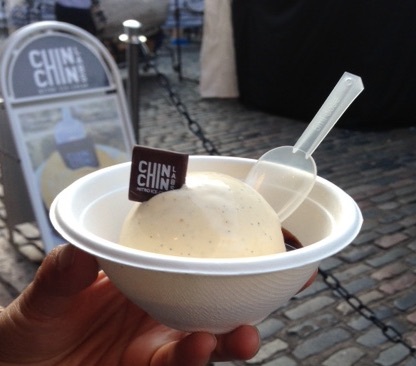 And the ice cream is definitely worth trying (according to the person I visited Chin Chin Labs with). But, if you happen to pass by Camden Lock and try some nitrogen ice-cream, please do spend a minute to ask yourself, what you think a scientist, or a lab looks like. And do let me know what you think, I’d be interested to know. * In the event of the failure of a liquid nitrogen dewar, the oxygen in the room would be displaced. The resulting decrease in oxygen concentration can cause sleepiness, mental confusion or in the case of severe oxygen depletion, coma and death (more info here, opens as pdf). Oxygen monitors check the oxygen level in the room is at a safe level. The beep is annoying but tells us that the monitor still has battery and is checking the oxygen level in the room.